When the Yankees put Masahiro Tanaka on the disabled list back on June 9, it didn’t appear to represent a massive blow to the club. The team was 42-19, in a virtual tie for first place with the Red Sox. Luis Severino was pitching like a Cy Young frontrunner. Tanaka, for his part, was having an inconsistent season. When he went down with hamstring injuries, he’d recorded a 4.96 FIP and 4.58 ERA for the season and had given up 10 homers in his previous six starts. The intriguing Jonathan Loaisiga was about to take Tanaka’s spot in the rotation — and would perform well in his absence — further limiting the potential damage of Tanaka’s loss. 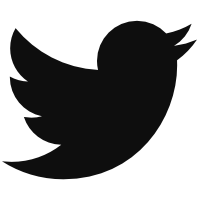 Fast-forward three months and circumstances have changed pretty considerably. Severino has cooled considerably, while other rotation pieces like Loasigia and Domingo German have fallen off the radar, having been replaced by solid additions in J.A. Happ and Lance Lynn. Without Severino fronting the rotation, however, the team lacks a pitcher with potentially dominant stuff to start the Wild Card game, leaving the possibility of a second straight involuntary bullpen game for New York in a winner-take-all matchup. Now Tanaka might be the best candidate for that role. The Yankees right-hander has always been very reliant on breaking stuff out of the zone to get batters out. His fastball sits in the low 90s and isn’t notable for a lot of rise (the four-seamer has a career 5.2% whiff rate) or a ton of sink (his two-seamer has a ground-ball rate below 50%), so he needs batters to swing at his offspeed pitches to be successful. That plan has worked over the course of his career. The graph below shows how often pitchers throw in the zone and how often batters swing at offerings out of the zone. The only pitcher close to Tanaka by these criteria is Patrick Corbin, who throws fewer pitches in the zone but also gets slightly fewer swings off the plate. This is important for Tanaka because, when he throws the ball in the zone, he tends not to get great results. The table below shows the biggest difference between at-bats that end in the zone versus those that end out of the strike zone. 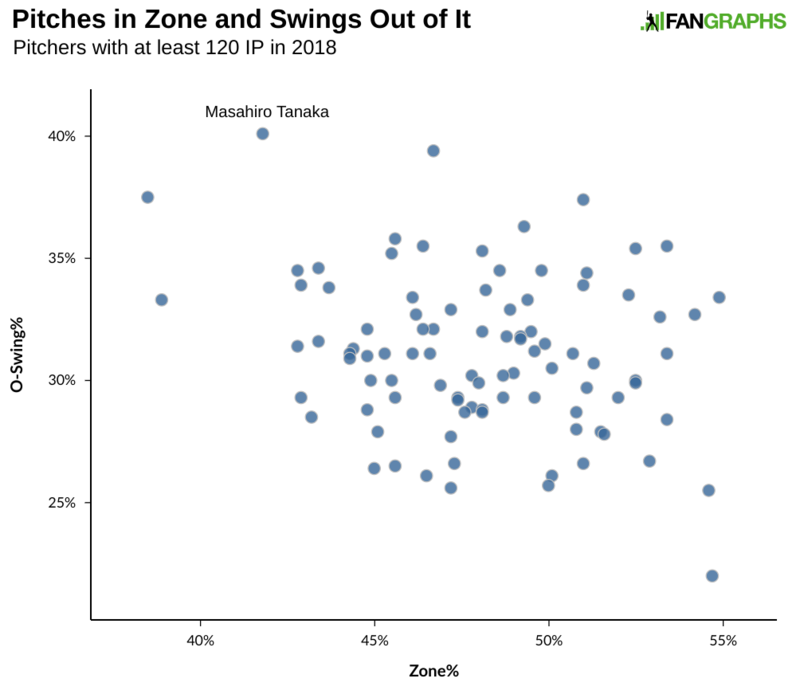 For reference, the league-average wOBA on pitches in the zone is .326 (Tanaka is below average there), while league average out of the zone is .293 (Tanaka is well-above average there), so ending as many plate appearances out of the zone is beneficial for all pitchers, but especially so for Tanaka. To provide another example, let’s look at Tanaka’s signature pitch, the splitter. This is where he’s thrown the pitch this season. Tanaka throws his splitter down the middle but also generally just below the strike zone. He gets a ton of swings and misses in the process, with a 22% whiff rate this year. The contact rate is very different depending on where the pitch is placed, and when hitters make contact in the zone, they tend to do fairly well, as the zone map below shows. 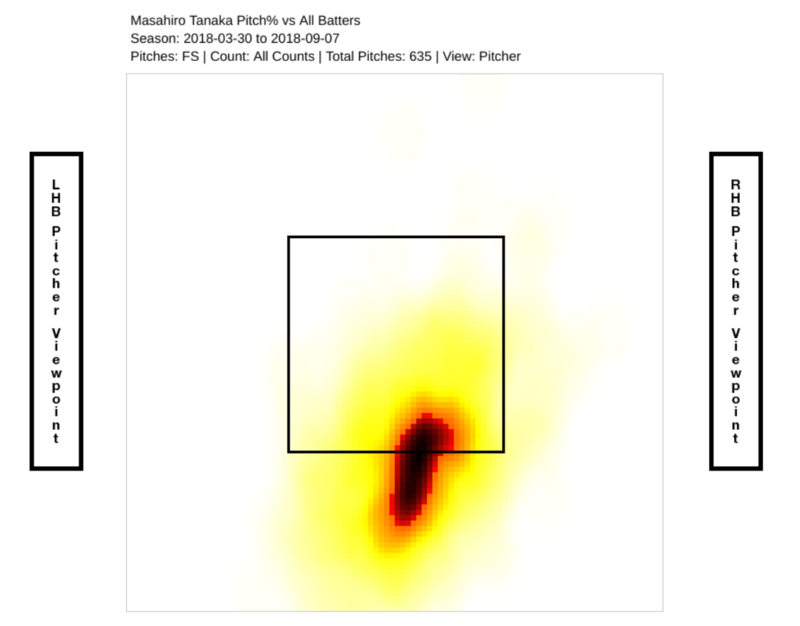 Tanaka has thrown 75 splitters to the middle-bottom of the zone, conceding a .133 ISO per pitch on those pitches. Just one level below that, however, Tanaka has thrown 169 pitches and yielded almost no damage. It’s not as though hitters are laying off that bottom section, either: they’ve swung at more than half the splitters thrown there. In the first half, this proved to be a problem for Tanaka, as he gave up 18 homers. Injuries somewhat cloud Tanaka’s history, but his effectiveness has long been dependent on reducing homers. Or, to put it another way, almost all of his poor stretches of play have been the result of giving up too many dingers. The graph below shows Tanaka’s rolling career FIP and xFIP with FIP including the actual number of homers and xFIP showing a league-average home-run rate. 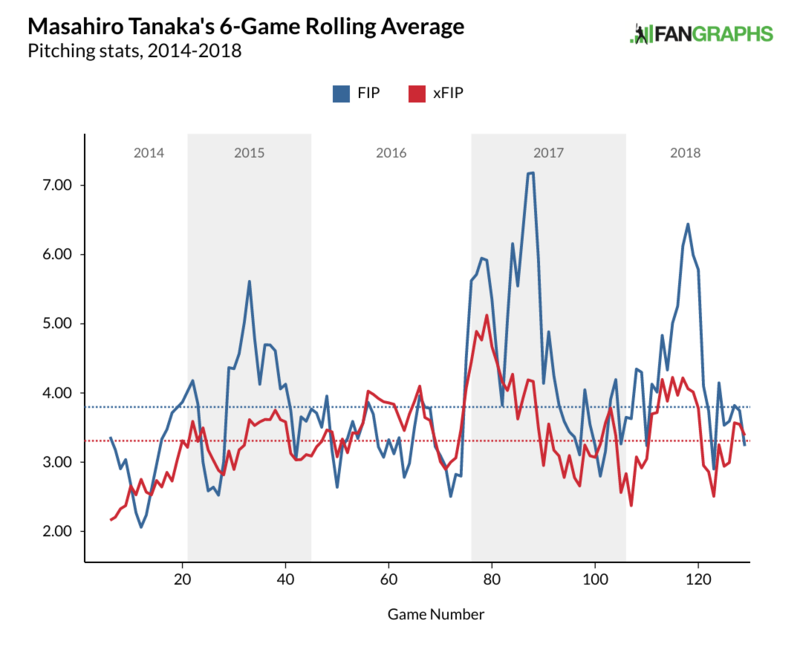 The xFIP never gets too high because Tanaka has always been pretty consistent with his walk and strikeout numbers, but his homers and FIP tell a different story. Tanaka is an example of why I’m reluctant to use xFIP much: giving up a lot of homers tends to tell us something about how a pitcher is pitching and is not necessarily just indicative of some bad luck. The walk and strikeout numbers move a little bit, but in the midsection of the season, the FIP jumps way up. That’s when Tanaka was giving up a ton of blasts. 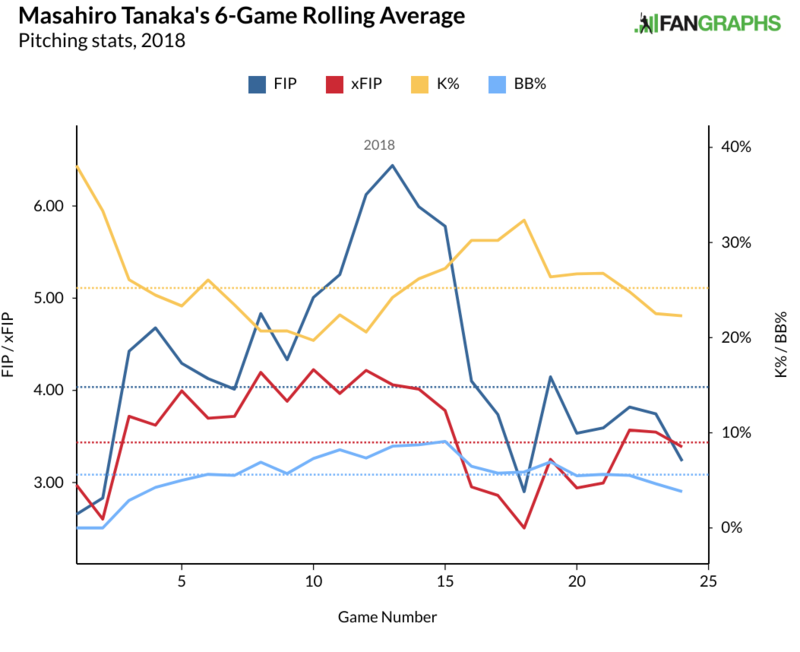 In the second half, Tanaka has given up just five home runs, and his overall numbers have been fantastic with a 2.80 FIP and a 2.30 ERA. 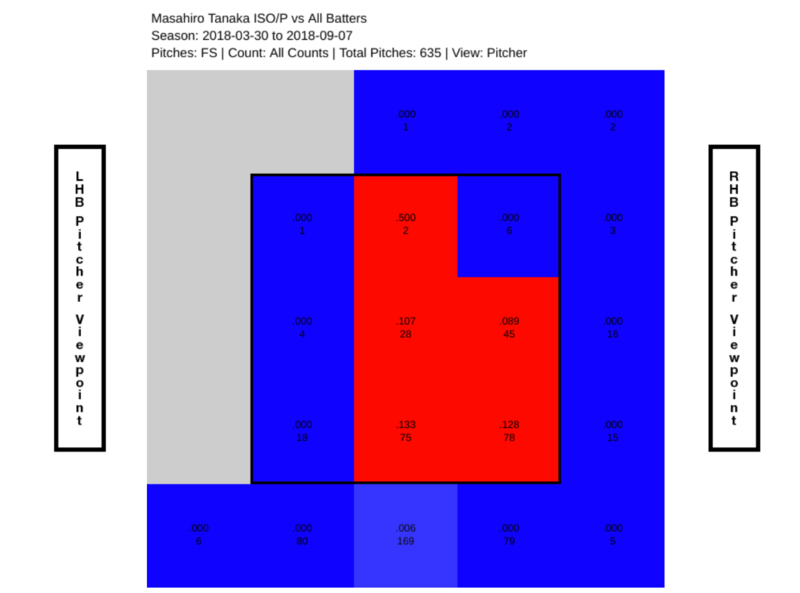 While not dispositive, Tanaka has benefited from pitching lower in the zone and putting his splitter beneath the zone. It’s perhaps a subtle difference, but the graphs below show fewer pitches in the middle of the zone and more pitches below. In the second half, Tanaka has done a better job of keeping the pitch down. That’s his second-half zone map on the right, first half on the left. A couple hittable splitters a game might not feel like a huge difference, but for every two splitters that get buried, we are talking about an extra swing that isn’t likely to result in any damage. Based on the graph above, Tanaka is burying four more splitters per game. That’s a pretty big difference. Whether Tanaka can keep it up remains to be seen. He’s gone through periods where sometimes the ball flies out of the park more often. Tanaka has always done a good job using the fastball and slider to get ahead in the count. He strikes out his fair share of hitters by getting batters to chase afterward. The few balls left in the zone tend to hurt him. There have been fewer of those pitches of late. If he can keep that up, the Yankees will have a No. 1 starter for the playoffs. We hoped you liked reading Masahiro Tanaka Is Getting Well at the Right Time by Craig Edwards! tanaka is so interesting to me as a yankee fan. hes so up and down that sometimes he looks like the best pitcher in baseball and sometimes he looks absolutely terrible. by the way the yankees have their pitchers lined up it looks like severino will start the wild card game, and i think it is the right choice with such a highly volatile tanaka, and they wont be facing the 2017 twins in the wild card game so i dont have a lot of faith that if they get down early they’ll be able to recover against the a’s like they did against the twins last year, but who knows? While I agree w/your concern re: Twins ’17 vs A’s ’18 on the ability come back and win via bullpen, I don’t buy that as a reason to use Severino vs Tanaka. They have both been inconsistent this season, just as different times of the year. The only major diff in my mind would be if you believed telling one of them “you’re only going through the lineup twice, so just throw everything you got” is better for one versus the other. Anecdotal, but Sevy looked like he did that last year and it didn’t go well. Not sure what Tanaka’s version of just “gunning it” through 3-4 innings would look like. I wouldn’t blame Boone for either choice. I don’t see how Tanaka is volatile, and certainly not compared to Severino of late. Which is the premise of this whole article, no? — Tanaka doesn’t have Severino’s ‘ace’ talent, but he’s been more consistent over the last ~10 starts. I think the opposite trade-off is more apt — Do you gamble you get peak Severino or do you go with the Tanaka who’s only had 2 bad starts in his last 10?